Riddhi Jain, Gold Award holder from Delhi Public School, Gurugram is sharing her Award Journey experience, especially the Residential Project. I was first introduced to the Duke of Edinburgh's International Award programme when I was in the 9th grade. When I was introduced to the International Award for Young People (IAYP), I was quite curious about the programme and how it would help me in my life. Deciding to join the Bronze Award was one of the best decisions I’ve ever made. It has been an amazing experience ever since. I went on to complete the Silver and Gold Awards as well. My journey with IAYP has been one with many challenges: from managing academics and extracurriculars to meeting deadlines. Nevertheless, I enjoyed myself thoroughly. I think the most important skill I picked up from the IAYP is interpersonal and communication skills. The Residential Project for the Gold Award was my personal favourite. It taught me how to work in a team. To step out of my comfort zone and go out in the open, meet new people, make new friends and most importantly, it taught me how to enjoy life outside home and away from my parents. Living with strangers in a village, learning their lifestyle and language was a little scary, but at the same extremely thrilling. We visited the village head -- the Sarpanch, spoke to the Panchayat about the administration of the village, went to the village school and taught the students there, and danced with them. We interacted with them and told them about our school. I learnt how to make round chapatis and had tea for the first time ever. The tractor ride was quite amusing. We also organised a cleanliness drive and took to the streets, after which we put up a street play on hygiene and sanitation and stressed on the importance of maintaining cleanliness. On the third and fourth day, I went to the farm and saw a variety of vegetables that were grown. Later, we were taken to the brick kiln and made a few bricks there, which were, to be honest, quite distorted. The task was very tough and tiring, yet fun. Shiksha Kendra, a philanthropic venture of Delhi Public School Gurgaon, Sector-45, is a school for remedial teaching for students from the ‘marginalised those at risk’ section of society. It is an afternoon school (1.30 pm - 5 pm) providing quality education to 1300+ students from classes 1-12. 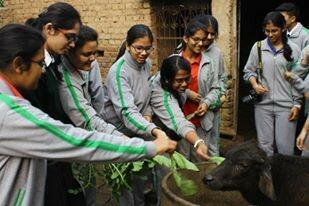 As it is a prerequisite that all students/members have to do community service, we at DPS Gurgaon want to extend a helping hand. We wish to invite all those children desirous of doing community service in the form of teaching to come and teach at the Shiksha Kendra run by the school. The IAYP participants of all three levels can volunteer to take classes from standard 1 to 5 on weekdays from 3 pm to 5 pm. Besides teaching academic subjects they can also conduct classes for co-curricular activities and train students in Dance, Theatre, Art, Vocal Music, Spoken English, etc. Award participants of The Aditya Birla Public School, Kotputli organised a campaign for environment awareness. A brief report from Jintendra Nath Tripathy, Award Leader. The children of Aditya Birla Public School decided to organize an awareness campaign to inform people about the hazards of environment degradation and the importance of ecological conservation. With this aim in mind, a wall painting campaign on environment protection was organized at the school premises on August 2, 2017. All the IAYP students, along with other children, took part in this activity under the guidance of Mr Ravi Sharma, the Art and Craft teacher of the school. This programme was organized to spread awareness about the causes and effects of environmental degradation and the methods for conservation and protection. Mr Vinay Bhalerao, Unit Head of Ultratech Cement Ltd., graced the occasion along with Mrs Sangita Christopher, Principal, ABPS Kotputli. This year's Gold Award Ceremony was organised on 20th July 2017 at the India International Centre, New Delhi. The National Award Authority (NAA) took immense pride in felicitating the Gold Award Holders, Award Leaders and Volunteers. This Gold Award ceremony is dedicated to appreciating the milestones and the commitment of each participant. The day was dedicated to celebrate, enjoy and cherish their achievements with friends, family and the IAYP team. This year the National Award Authority was privileged to invite Dr Vivek Raghavan, Chief Technology Officer, Team Indus as the Chief Guest and Sue Walker, Asia Pacific Regional Director of The Duke of Edinburgh’s International Award, who graced the occasion with their presence. The host and compere for the ceremony was Ranjana Rai, Award Leader and Member of the National Training Panel, who kept the audience engaged with her lively exchanges. She commenced the Gold Award Ceremony by welcoming the Chief Guest and all the Awardees, Award Leaders and Parents. Mr. Kapil Bhalla, National Director, had the privilege to welcome the Chief Guest Dr. Vivek Raghavan, Regional Director Asia Pacific Sue Walker, Himmat Kalsia (Chairman, APF), Dr. Sanat Kaul (Managing Trustee, APF), Vinay Sheel Oberoi (Member Trustee) and Vice Admiral SP Govil (Retd.) Former Trustee and National Chairman. This welcome address was followed by honouring the school principals who were there to grace the occasion. Mr Bhalla welcomed and congratulated Naina Lakhanpal, Principal, Him Academy, Vikas Nagar, Hamirpur; Dr R. D. Thakur, Principal, K.C. Public School, Jammu; Vivek Gautam, Principal, OP Jindal School, Raigarh; Skand Bali, Principal, G D Goenka World School, Gurugram; Major General TPS Waraich, Director, Yadavindra Public School, Mohali; Vikaram Singh, Bursar, Yadavindra Public School, Patiala; Jorawar Singh, Principal, Cambridge International School, Phagwara; Aditya Kumar Sharma, Principal, SYNA International School, Katni and Wing Cdr Ranjit Kumar Mandal for their invaluable support and contribution to the Award Programme, and presented them the Friendship Badge. A variety of entertainment performances were presented by Award Participants, commencing with a group dance by Award participants of ISPG sponsored Special Project at Sri Sarada Math, Baladband, West Bengal. This was followed by a solo classical dance performance by Shubhangee Goel, Award Participant from Delhi Public School, NTPC Vidyut Nagar. Sharing some of the memorable and life transforming moments from the diaries of Gold Awardees, which will inspire the Gold Award achievers, is another important event, and Pallavi Gill and Md Imran, both Gold Award Holders, who are representing India at the International Gold Event, 2017 to be held from 25th October – 30th October 2017 at Prague, Czech Republic shared their life transforming experiences with the house. National Director Kapil Bhalla addressed the audience, sharing information of the progress of the Award. He outlined future plans that have been designed to spread the Award Programme to untouched areas of the country. Kapil Bhalla also highlighted the achievements of the Gender Diversity and Empowerment Project run by IAYP India under ISPG Grant. The National Director's speech was followed by the Award Presentation Ceremony where the Chief Guest Dr Vivek Raghavan handed the Gold Certificates to the participants while Sue Walker honoured a select group of Award Leaders with Special and Voluntary Service Meritorious Certificates. The Chief Guest, in his speech, congratulated all the Awardees and Award Leaders for their success. Sharing some life experiences, the story behind participating in Google Lunar X Prize, and other details about #harindiankamoonshot with the audience. The Gold Award Holders of Sri Sarada Math presented Rakhi to the guests. These Rakhis were made by the participants under the Skill Development programme of ISPG sponsored Gender Diversity Empowerment Project at Sri Sarada Math, Baladband, West Bengal. The IAYP thank the Chief Guest, Regional Director, Award Holders, Award Leaders, Principals, Parents, Guardians and our Trustees for being there to make this Gold Award Ceremony a success. For Gold Award Ceremony pictures, please click here. An Award Leader Training Workshop was organised on 11th - 12th August 2017 at the Award Training Centre, New Delhi. The workshop was attended by 17 participants from Renok Adventures LLP, New Delhi; Sree Vidyanikethan International School, Tirupati; Sapphire International School, Ranchi; Lancers International School, Gurugram; Chanderbala Modi Academy, Ankleshwar; Vidya Sanskar International School, Faridabad; Pathways World School, Gurugram; Indirapuram Public School, Indirapuram, Ghaziabad; INME Learning, Gurugram; Indian School of Management & Entrepreneurship, Mumbai; ITM Global School, Gwalior; The Ardee School, Gurugram; and J P International School, Greater Noida. On Independence Day, here’s wishing our dreams of a new tomorrow come true. Freedom in the Mind, Faith in the words, Pride in our Souls. Let’s salute the Nation… on Independence Day. Sasi Krishnan (Award Leader), Sanjay Ghodawat International School, Atigre, Kolhapur, Maharashtra is sharing a report on Cleanliness Drive. Award participants of Sanjay Ghodawat International School, Atigre have undertaken a project in the village of Hatkanangale in the Old Market Area on 29th July 2017. All the 96 Bronze and 8 Silver participants were involved in this activities, supported by 15 teachers. The project is towards the Service Section of the Award programme. The main aim was to undertake a cleanliness drive to clean the open drains and thereby prevent the spread of various communicable diseases. Initially, the team found the task difficult, because the drains had never been cleaned after they were made. They were stinking and choked with polythene and surrounded by tall grass. But with the cooperation of Mr Santhosh Redekar, one of the Ward Members of the Hatkanangale Gram Panchayat, the team managed to take up the drive and arranged sickles and baskets to clean the garbage. Pratiksha Bora from Maria's Public School, Assam received her Gold Award on 20th July 2017 at the Gold Award Ceremony 2017 at New Delhi. 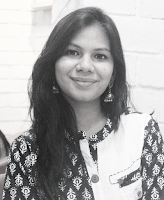 Pratiksha shared her Gold Journey experiences with us. I can still remember the day I first enrolled for the International Award for Young People. I was really enthralled to receive the diary, though I never imagined that I'd be able to complete my gold level. My prime reason for getting enrolled in the IAYP programme was to overcome my weaknesses. And today I can proudly claim that I've accomplished my aim. The various aspects of the Award have unleashed the potential in me. Physical Recreation, as well as Skills sections, take the credit for the holistic development, and the Adventurous Journey has made me realise the value of being independent and an awareness of the hardships of life. The challenges posed at every step has helped me change my habit of complaining. The Service section has taught me to be selfless and has imparted me the satisfaction of helping someone in need and, most importantly, helped me to overcome my weakness of being an introvert. Another change that I've perceived in myself is that I've become more self-reliant, for which I shall always remain obliged to the Award programme. The various aspects of the programme have also taught me how to manage my time. Before enrolling for the Award I was not engaged in any Physical Recreation game as I was unable to do time management. But, thanks to IAYP I've learnt to manage my time for sports and academics, as well as skills. In today's world where there is a need for being an all rounder, IAYP helps us to become one. From time management to holistic development, IAYP has made me a completely new person and, most importantly, has helped me overcome most of my weaknesses.